Marvell is introducing three smartphone platforms at MWC, with the new PXA2128 multi-core application processor. Marvell Technology Group is introducing three new smartphone reference designs at Mobile World Congress this week, with an emphasis on support for TDD-LTE (Time Division Duplexing) and TD-SCDMA (Time Division Synchronous Code Division Multiple Access) networks, such as those being developed by China Mobile. Clearwire, in the U.S., is in a joint development with China Mobile for TD-LTE development. To construct the reference designs Marvell is introducing a new multi-core applications processor, the PXA2128, which they have paired with their multi-mode modem chips: the PXA1202, PXA1802 and PXA1801. Marvell introduced the PXA1202 at PT/EXPO Comm last year, shortly after the announcement of the PXA1801 "World Modem". The PXA1801 supports FDD-LTE (Frequency Division Duplexing Long Term Evolution) and TDD-LTE, along with DC-HSPA+ (Dual Carrier Evolved High-Speed Packet Access) for WB-CDMA (Wideband Code Division Multiple Access) and TD-SCDMA, and EDGE (Enhanced Data rates for GSM Evolution). 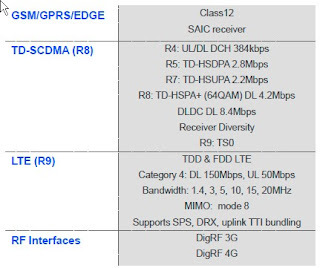 with an emphasis on on TD operation, for TDD-LTE and TD-SCDMA. Dr. Lu Chang, Director of Mobile Products at Marvell, says that the PXA1202 is the world's first to support DLDC (Downlink Dual Carrier) for TD-HSPA+, enabling 3X faster download on existing TD-SCDMA networks. The PXA1802 supports both Category 4 TDD-LTE and FDD-LTE, with a maximum download (DL) rate of 150Mbps, and an upload (UL) rate of 50Mbps. 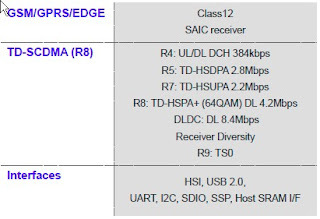 The difference between the 1802 and 1801, says Chang, is that the emphasis in the 1802 is on TD modes, supporting handoff from TDD-LTE to TD-SCDMA. 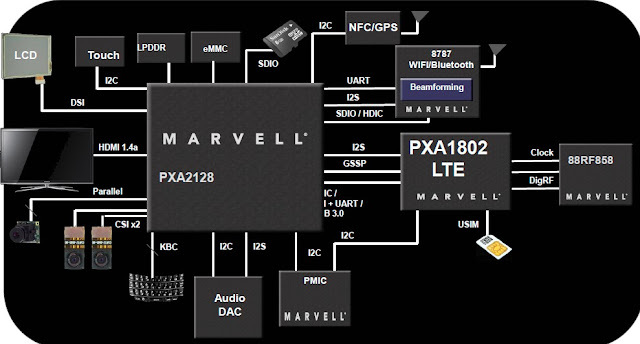 Marvell sees the PXA1802 being used in high-end smartphones, paired with an application processor, or in MiFi portable hotpot devices, paired with a separate WiFi radio chip. The PXA1202 is a scaled down version, or subset of the 1802 says Chang, for low-cost 3G MiFi and smartphone applications. 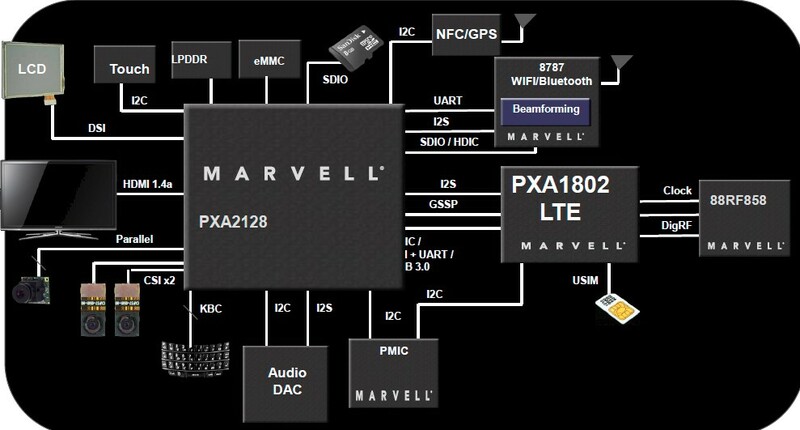 The Marvell PXA2128 marks a trend toward a big/little mix of processor cores in mobile application processors, such as NVIDIA's 4-plus-1 architecture in the Tegra 3. Marvell employs a hybrid symmetrical multiprocessing architecture, said Chang, with dual ARMv7 cores that are comparable to the Cortex A9, combined with a third, smaller core for low power operation. Marvell was able to optimize the ARM cores for performance-power tradeoffs, since they hold an ARM architectural license. Chang says that the processor is capable of supporting all releases of Android, including Ice Cream Sandwich. Marvell is currently sampling the PXA2128 to its lead customers.